North Korea, ranked five in the world, play their first game against America on June 28th. Yes, an interesting political match-up there. One Korean blogger says: "Because the women's team does relatively well, the better coaches prefer to coach the women's team." I read a little more about the history on Ask a Korean, it seems the team was set up in 1986 with women from the track and field teams. One of the highlights of their games is beating their neighbours South Korea. 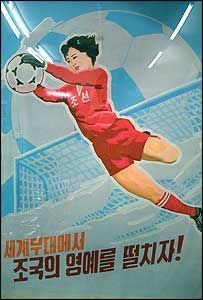 If you've been a longtime women's soccer fan, you might recall a crazy incident a few years ago when some North Korean players were less than impressed with a referee's decision. What are your predictions for the tournament?